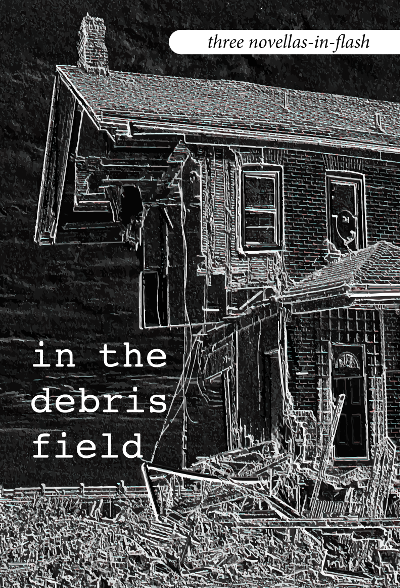 This is never truer than with Luke Whisnant’s In the Debris Field, the title novella of Bath Flash Fiction Award’s trio of novellas in flash. Whisnant tells the story of Dennis (referred to throughout almost solely as ‘You’), his twin sister Denise and brother Donnie as they skid through childhood to middle-age. Contained in such small parcels, each tale’s narrative is heightened, summoning the raw emotions of adolescence with soaring skill. Drawing us into the aftermath of a hurricane, and taking in music, desire, slutty teachers and grief, the tales draw you neck-deep into the mire of memory and imaginings, where titles work as hard as the stories they flag. Whatever your age and wherever you grew up, you’ll find nostalgia welling up at unexpected moments, tapping into instances long forgot till Whisnant chose to dig them up. Latter Day Saints by Jack Remiel Cottrell offers a change of pace. Drawing us into quest that already seems to be underway when we join it, we’re led into shops, jam-packed homes, a church, a bar and a taxi to meet a motley assortment of saints. Far from being otherworldly and ethereal, these are people pulsing with blood, vim, and often, it seems, crushing disappointment. Our guide, the jacket copy tells us, is a young man trying “to find answers about life and whether it is worth living.” Reading these vignettes green, however, it takes a while to work out why we’re following this saint-botherer, or, indeed the significance of the individual saints. But that renders these protagonists and antagonists no less compelling. From St Clare of Assisi, who people can’t help but pester for autographs, even though they’re unsure who she is, to St Fiacre, who “does Uber during the quiet times” when he’s not driving a branded cab, and vapes rather than smokes to get his “nicotine fix and smell like strawberries”, these saints are three-dimensional, present day figures. Laced together into a novella, these flashes are like views caught from a train window, offering glimpses into lives full of dust and, on the whole it seems, regrets. A thought-provoking assortment of characters who will worm their way under your skin. A Slow Boat To Finland by Victoria Melekian is the most heart aching of the trio. Written with naked honesty, it shares the grief, bewilderment and gradual unraveling of Kat, whose young daughter Molly has died. Melekian captures the gaping horror of a wound that seems unlikely ever to heal. A granny with dementia and a transplanted heart offer just a hint of the complexities spiralled inside these pockets of insight. The beauty of these stories draws you into intensely private moments, as Kat grapples with the question: “How do you move on from a loved one you carry in the marrow of your bones?” And yet even as we stumble with Kat amid this particularly jagged debris field, there is hope of finding a path across, and of leading others through it too. The three authors’ whose flashes have been bound into this single volume each offer us their own unique voices, observations and imaginations, and each in their own way hark back to the topic of loss and survival. Three extraordinary examples of the scope of flash fiction and its power to connect with our curiosity and empathy without a single wasted word. This entry was posted in Reviews and tagged In the Debris Field, Jack Remiel Cottrell, Luke Whisnant, Novella in Flash, Victoria Melekian by Judy. Bookmark the permalink.